So I was away for a few days and looking for a new spot to eat. My host suggested I try Amura for the sushi, so off I go. Located in a trendy and upscale spot, that offers shopping and dining all within easy walking distance of parking. Since I was solo I opted to sit at the sushi bar, which I had all to my self, I always like to look at the fish before I dive in. Everything appeared to be fresh and placed quite nicely in the display case. Sushi making area was organized and well staffed. This restaurant itself was busy, and the bar packed. What I did not realize the sushi bars proximity to the alcohol bar can be quite annoying and loud especially, on Thursday when ladies drink Martinis for $5.00 from 4 to 7. Don’t get me wrong, I am a martini drinker but the noise level became almost painful, the more they drank the louder they became, with the addition of a guitar strumming hunk, these ladies were off the hook. I did share this with my host and he was most amazed and amused I had not joined them. Lets do food, I had my favorite sushi restaurant drink, unfiltered cold Saki, it came in the usual white carafe, not bottle as I am accustomed to, and it did not taste as good as others I have sampled. Must have been the “house sake”. Not a good start for me, but I remained open minded. I was given the universal paper menu to mark my selection, but was quite happy when the woman who bought me the drink, took care of all my needs. 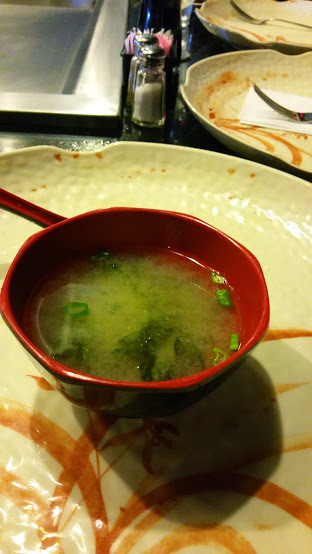 I started with Miso, yes I know how pedestrian, but I love Miso, I did not love this particular offering, bland, what appeared to be shredded um perhaps kale, or collard greens. I had to leave it. I am thinking this is not a good start. Both of dishes made up for the soup and Saki. 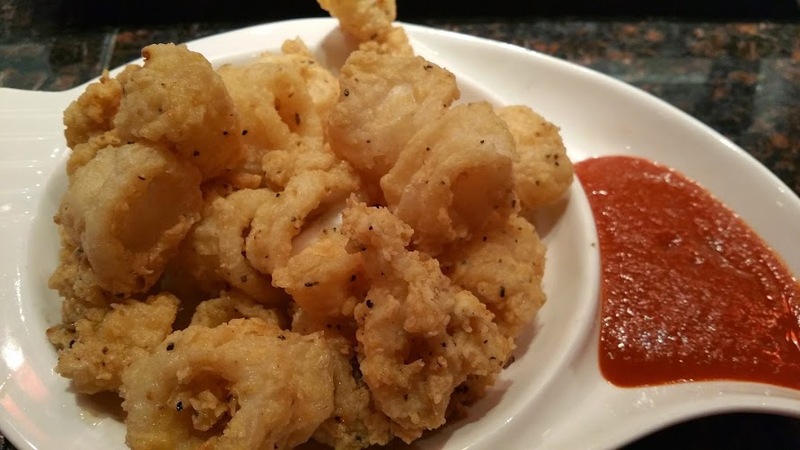 Calamari was crisp, tender a delight to the buds, add the Sriracha Sauce and it was brilliant. Tuna tower a perfect presentation of tuna, layered with spicy tuna and rice. It was huge so I sacrificed the rice and picked out all the tuna, I was not going to miss a drop. 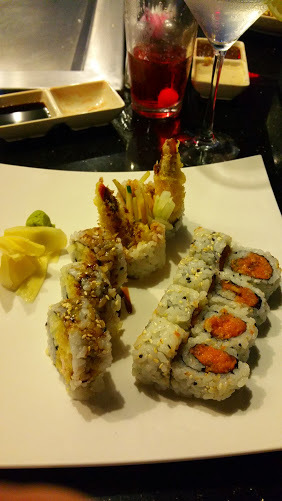 Next I selected two rolls, Spicy Tuna and Shrimp Tempura. Nothing special noteworthy here I have eaten both these rolls numerous time, I just like them. Still not done, well full but not done I opted for the Red Tuna Takati and Shrimp and Vegetable Tempura. Once again, two delightful dishes. 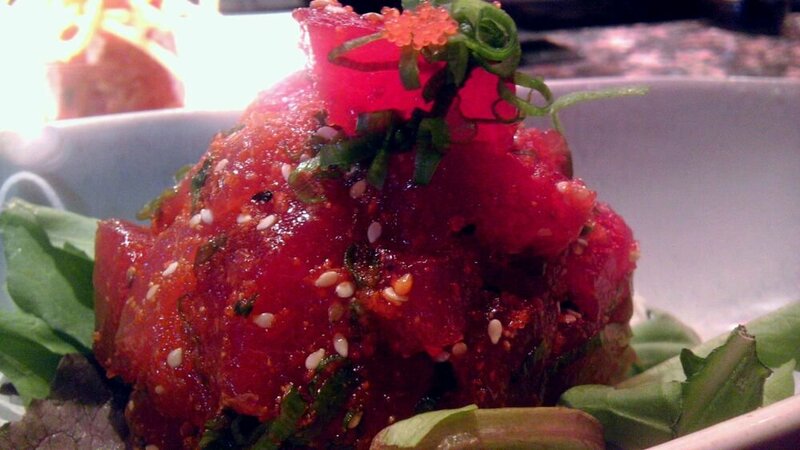 The tuna had just the right amount of spice and was artfully nested on a bed of fresh greens. 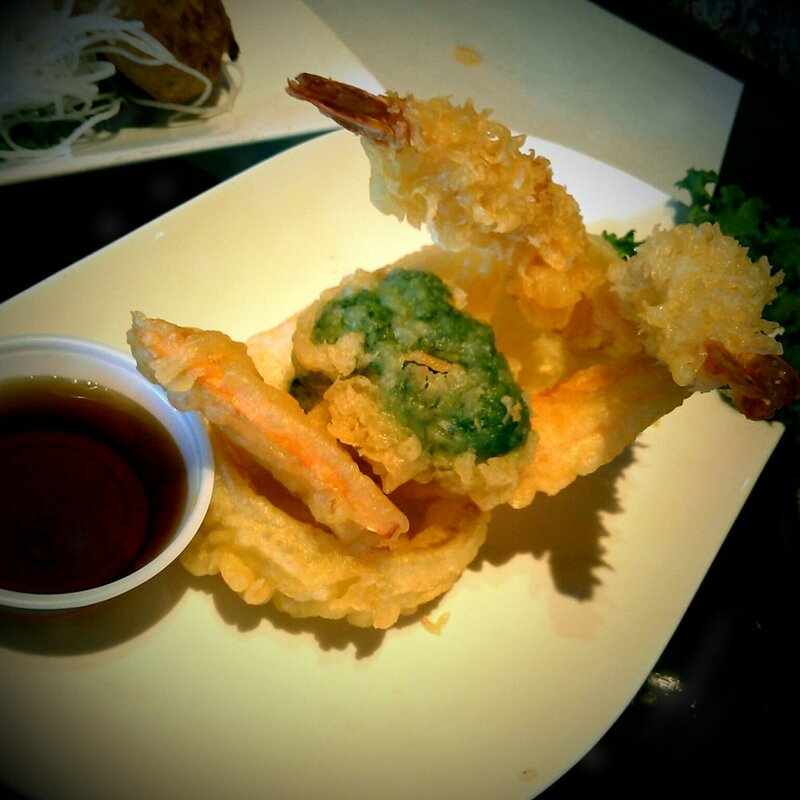 All tempura is not created equally in my world, but this dish passed the test of crispy not soggy. 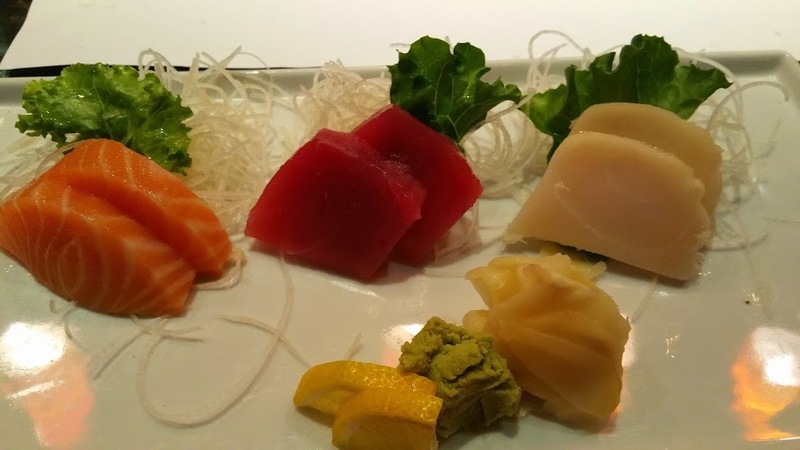 For my last dish the Sashimi Sampler, six perfectly sliced pieces tuna, salmon and escolar. Salmon was my favorite, it was like butter in my mouth. Tuna firm, tasty left me waning more. I was not a fan of the escolar, it may have been too dense a fish for me, I am big on texture, but the taste was sweet and pleasing. Overall, I would give this spot a four out of five. They advertise as being among the Zagat Rated, Worlds Top restaurants, this may be a stretch for me. 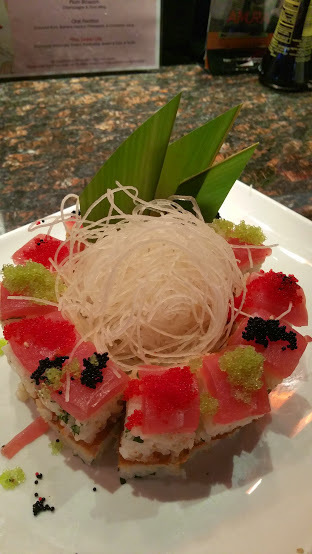 There are other sushi restaurants I have found in the Oviedo, Lake Mary area with more creative dishes and presentation. Perhaps I will return on a Thursday night and take advantage of the Martini specials.